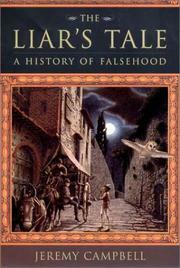 An unusual and boldly compelling history of deception and the decline of truth. Simply put, Campbell claims that lying is part of our true nature: “for better or worse, lying, untruth, is not an artificial, deviant, or dispensable feature of life.” In fact, human beings, as supremely conniving as we may like to think ourselves to be, are hardly alone when it comes to the ability to deceive. Taking us back to Darwin, Campbell offers numerous examples of creepy crawlers and fireflies capable of duping would-be predators or foes with a deft change of color or imitation of another species’ flashing signal. If such proclivity to deceive is the norm in survival at the lower end of the animal kingdom, is it not naïve of us to think ourselves as having evolved beyond it? After all, the author points out, some of western culture’s archetypal heroes (like Odysseus and Machiavelli’s Prince) have been deemed such because of their exceptional guile. The argument moves in and out of literal nature and art to chart philosophical trends in truth and deception across the centuries. Starting with Socrates and notions of absolute truth, Campbell examines an impressive array of philosophers (Descartes, Hume, Newton, Kant, Nietzsche, Wittgenstein) who helped an avoidance of untruth evolve into suspicion, distrust, and falsehood becoming valued for the possibilities they open the mind to. He enlivens the heady theoretical discussion with pointed biographical tidbits from the lives of his subjects, as well as pertinent vignettes plucked from the current of human affairs—from Clinton’s survival of the Lewinsky affair to Liberace’s denial of his homosexuality to win a libel suit. Throughout, the prose is as sumptuously engaging as the argument is provocative.